Compatible Polycom phones : IP 320, IP 321, IP 330, IP 331, IP 335, IP 430, IP 450, IP 550, IP 560, IP 650, IP 670, VVX 300, VVX 310, VVX 400, VVX 410, VVX 500, VVX 600, VVX 1500. Polycom Electronic Hook Switches (EHS) allows you to answer and hang-on a call remotely within the wireless 300 feet (Max. but Can be reduced by environment) headset range instead of a mechanical handset lifter. The amazing Pioneer wireless headset allows you to roam your office while you talk with up to 300 feet of range to roam your office. You'll improve productivity as you're able to gather information throughout your office while continuing to talk. 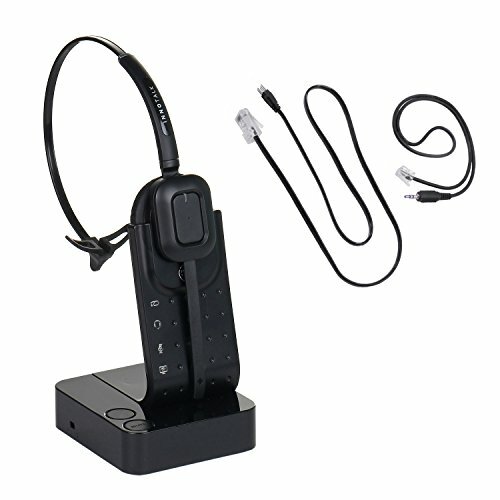 * Noise Cancelling Microphone * Digital Signal Processing makes clear sound quality * 2 wearing styles as standard ear-hook, surfeit headband * Changeable headset color - Black and Wine color * Automatic Pairing Process * Fast battery charging * Incoming call notification * On-call illumination * Mute button on base and headset unit. Max 8 Hours Talk time will be reduced when operating in high speaker volume or Calls at a long distance, in a state such as a radio wave blocking environment. DON'T COMPARE This Professional Polycom Wireless Headset with General Bluetooth Headsets. Compete with Plantronics and Jabra GN netcom High-Grade Wireless Headsets. Multi Year Warranty, 20 Year Proven Quality in The World. REMOTELY CALL ANSWER/END function within the wireless 300 feet headset range. COMPARE to Plantronics wireless headset + APP-5 (EHS), Jabra wireless headset + Jabra 14201-17(EHS). If you have any questions about this product by InnoTalk, contact us by completing and submitting the form below. If you are looking for a specif part number, please include it with your message.